In the somewhat shadowy world of the B movie, a grindhouse is an American term for a cinema that specialised in showing exploitation films. Such films including a range of sub-genres and, while some are perhaps of very dubious taste, others, such as spaghetti westerns, biker films, classic low-budget horror films, Kung Fu or blaxploitation movies, gained a cult status and even transitioned into mainstream cinema. As part of the whole creative ethic that went with each of these styles of film, their music was distinctive and, over time, has become iconic. All of which is where the latest sample library/virtual instrument collaboration between Big Fish Audio and Funk/Soul Productions comes in. 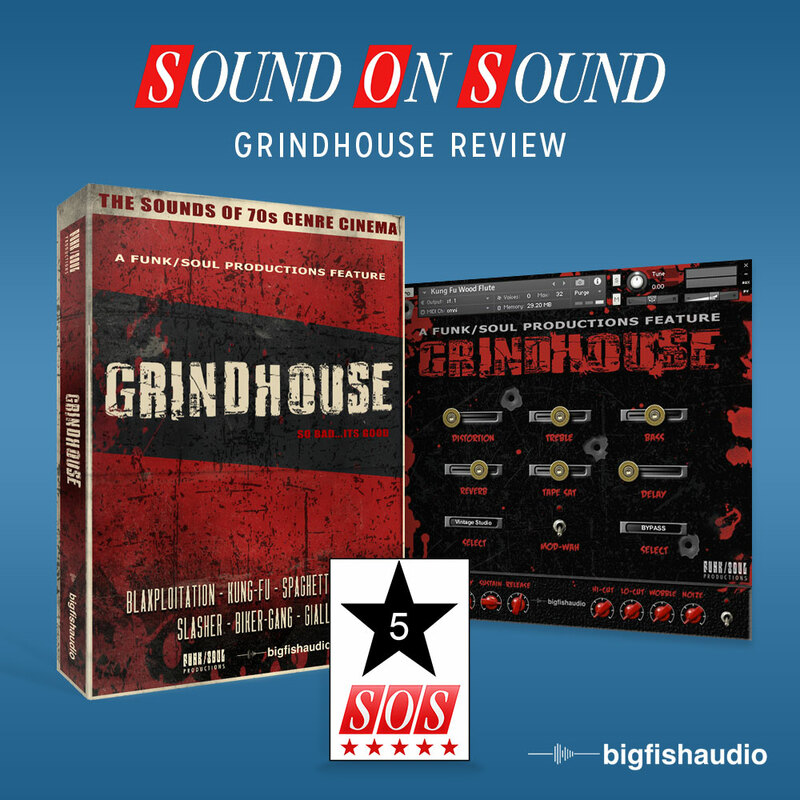 Presented in a suitably lo-fi-looking Kontakt front-end (free Player or full version), Grindhouse provides a collection of playable instruments that aim to capture the musical essence of some of the more popular sub-genres of the B movie/exploitation film soundtrack. The library is built around some 12GB of sample content and this is spread across over 70 virtual instruments. These instruments are divided into six sub-categories — Drums & Percussion, Horns & Winds, Vocals, Strings & FX, Keyboards, Basses and Guitars — and, in many cases, the individual instruments offer more than one playable articulation. So, for example, Spaghetti Western Mariachi Trumpet offers five different articulations including legato, staccato, swells and falls. This is, however, a very eclectic collection of sounds. For example, the keyboards include patches such as ‘Blaxploitation Mutron E7 Clavinet’ or ‘Horror Movie Toy Piano’, the Vocals/FX category offers Spaghetti Western whistling alongside Kung Fu sound effects, while the guitars include a ‘Vibrato Surf Guitar’ and a ‘Deconstructed Shafty Guitar’ amongst others. While many of the sounds are deliberately lo-fi in nature to capture the ’50s to ’70s sonic footprint, the front-end includes further options for fine-tuning with suitably retro distortion, tape saturation, reverb and delay options available. You also get basic amplitude envelope and EQ options. If you are looking for a generic sound palette, this is perhaps not the place to be. However, if you want the B movie sound, all of the instruments are jam-packed with exactly the right character: play just a few notes and your music cue will instantly be filled with the appropriate vibe. Grindhouse offers enough to build complete cues on its own but, equally, you could just drop these sounds into productions including more conventional sounds to create the lo-fi, B movie atmosphere. Grindhouse might be a niche product but, at this price, I’m sure working media composers with an interest in the music of cult movies will lap it up. Cool, cult sounds, and full of character.